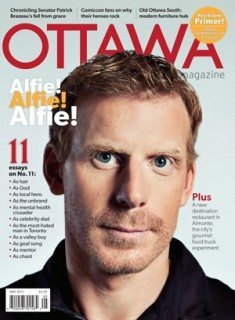 In April 2013, Ottawa Magazine honoured the captain with the “Alfie Pack,” deconstructing the Senators’ icon with 11 essays on No. 11. By July, he was a Detroit Red Wing. A few months ago they were celebrating the 62/63 Leafs at the Air Canada Centre. I sat in the press box, which is something I sometimes do. The Leafs were playing Ottawa in the Battle of Ontario, even though it’s lately been a war fought mostly in the stands: hairy, swearing men versus hairier, swearier men all drunk on the same bad beer. I was once compelled by this battle in my time following the Maple Leafs through the 2000s. Back then, I remember being booked to appear at a bookstore in Edmonton (to promote my book Baseballissimo) but hid in my hotel room as long as I could to watch the late stages of a playoff game taking place in Ottawa. The publicist found me, pushed me into her car, then pulled me to the reading. The bookseller was livid that I was 20 minutes late, telling me that I would no longer be welcomed back. But it was okay. The Leafs won, the Senators did not, and Edmonton notwithstanding, all was steady in my world. 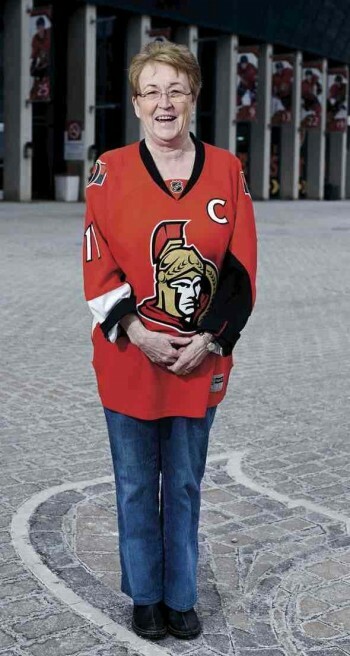 The ceremony to honour Leaf septuagenarians was a plodding affair, as most of these things are that don’t involve the Montreal Canadiens, and even then, their more-is-more routine and a penchant for honouring Vincent Damphousse was wearing a little thin. The old players came out from the far end of the rink riding in convertibles, two per bench. A pad of funereal organ music played, and the announcer check-marked each player as he appeared: Shack, Armstrong, Bower. His voice echoed around the rink, which was half full for the ceremony, a flash snowstorm slowing highway traffic and filling subways to capacity. Farber said, shaking his head, “I can’t believe how few people are here!” I told him about the weather, but you could tell what he was thinking: “In Montreal, fans would fight their way by dogsled or snowshoe to take in this sort of thing.” This may be true in the utopian City of Lights, but Montrealers are also responsible for those Just for Laughs: Gags. So they’re not, like, perfect or anything. The last of the cars came out, delivering players onto the blue carpet at centre ice. The announcer said, “And here they are, your 1963 Stanley Cup champions!” There was some applause — certainly not enough for Farber and not enough to dull the sound of the end gates being opened, out of which emerged the visiting team: the Senators. The crowd turned their attention away from the old-timers to greet Ottawa. The announcer repeated his cries to applaud for the ’63 Leafs, but the crowd was prepared for what would happen next: an announcement of the starting lineups. Ottawa went first, and eventually, they got to the forwards. Hearing his name, the crowd burst to life, a deep, lowing booooooo soaking the entirety of the arena. I poked Farber in the elbow as I pointed at the player who had engaged such conviction among the sleepy thousands.